The term military art refers to art that depicts military equipment, uniforms and important military figures, as opposed to war art which depicts actual conflict. Some group the two genres together but I see them as two distinctly different types of work. 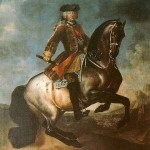 To me, a portrait of a monarch on his battle horse is far different than a painting of that same monarch swinging a sword in the heat of battle. The level of detail in military art is often far greater than in war art, simply because the subject or the work is much narrower of field. As you can see, The Famous Artists only has one example of military art so far – a portrait of a Duke in full uniform riding into battle. Hopefully, the Duke will not be our only example of war art for much longer.